Up for review today is the Arturo Fuente Don Carlos Personal Reserve, a fairly difficult to find cigar from Fuente. The company created the cigar in 2015 to celebrate the 80th anniversary of the family patriarch. TLDR on this one: it’s a good cigar (though not the best from Fuente). More below. The Don Carlos Personal Reserve is branded in the typical Don Carlos fashion, though with the added band noting the “Personal Reserve” status. The outer wrapper is a dark, marbled brown with some small veins but with very little texture. When squeezed, the cigar is almost entirely stiff, though not dried out or compromised as no cracking occurs. The pre light draw is moderately restrictive, probably a 6/10. On the pre light draw, there isn’t much going on. Just some light earthiness and some wood. The smell of the foot of the cigar has some heft to it, mainly with dry wood and some spice. The cigar opens with lots of lush, creamy, medium bodied smoke. 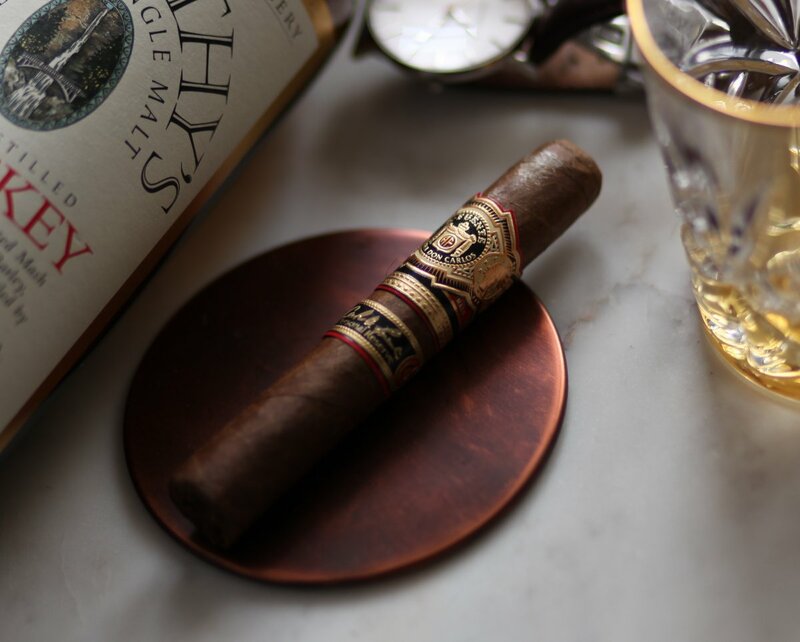 In it, there are some classic Fuente vegetal notes, light floral notes, a bit of dry wood and some mild red pepper that tickles the top of the tongue and also is felt on the retrohale. The creaminess though is the star of the show, it’s just an awesome texture for the notes to play in. At about an inch in, the flavors begin to morph a bit, with the vegetal notes rounded out a bit with a nice milk chocolate vibe. Overall the cigar is almost perfectly balanced between the sweet and bitter end. As the ember hits the second third, that quintessential Fuente vegetal note is taking front seat alongside the creamy finish. At the same time, a new flavor saddles up alongside, a subtle sweet note that I can’t quite describe by analogy to any other food. It makes for an interesting combination of flavors for sure, but one I’m glad to have. Construction has remained solid, with some waviness to the burn and an ash that hangs on in one inch increments. In the final third, the body and strength edges up above medium. The vegetal and red pepper notes are dominant, and the creamy texture has turned into more of an Oak. It’s in the last two inches that the cigar hits it’s top end in strength and body, weaving together bitter espresso, cream, vegetal, and red pepper. While not the most complex cigar, the Don Carlos Personal Reserve delivers tons of flavor, and more importantly, the flavors harmonize completely. Construction was for the most part spot on with the exception of a bit of waviness. Overall, the Don Carlos Personal Reserve is a cigar to seek out and purchase. It isn’t cheap, but it is well worth it, particularly for fans of Arturo Fuente cigars and especially the standard Don Carlos line.